FOUND - Carter's GARDEN PARTY White Rabbit Wearing GREEN OVERALLS with ROSE PRINT Plays Twinkle Twinkle? 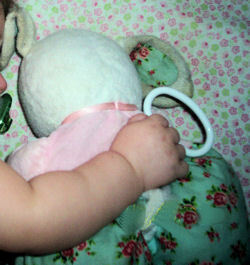 Home→FOUND→FOUND – Carter’s GARDEN PARTY White Rabbit Wearing GREEN OVERALLS with ROSE PRINT Plays Twinkle Twinkle? ← DANGER!!! WARNING ABOUT Some SATIN LINED BLANKIES!!!! FOUND – Carter’s GARDEN PARTY White Rabbit Wearing GREEN OVERALLS with ROSE PRINT Plays Twinkle Twinkle? My daughter lost this bunny while leaving the hospital with her older brother…probably in the parking garage in Atlanta, GA at CHOA. It was her best friend, and she hasn’t slept well since. It was bought in December of 2006, and was her first toy. If you can help Erica find this Carter’s Garden Party White Rabbit wearing Green Floral Overalls that plays Twinkle Twinkle?, THIS SITE IS NO LONGER ACTIVELY MANAGED. Please use Our FREE FACEBOOK GROUP, including #092508-1 in the subject, . 150165245194 There’s a bunny in the pic – is that it? That one must be part of the same series, but that’s not it. Hers has a lot more floral print, plus it is a crib pull musical version. 090508-1 same bunny in pink. different song?